Every holiday season, there always seems to be that person that just wants cash. Instead of just handing over a couple of bills or sticking it inside a card, try some of these more creative ideas. Life is like a box of chocolates, you never know what you’re going to get. In this case, it’s cash. Buy a box and eat the chocolate (sounds good so far, right?) Fold the cash into shapes that will fit into the empty spaces and you have a super simple, but still creative, gift. A fun way to give someone money is using origami, the Japanese art of folding paper into shapes or figures. 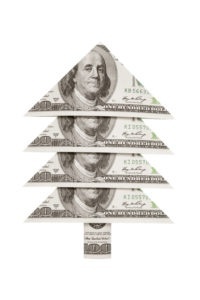 Some ideas to help you get started include a shirt, a guitar, a heart, or even a money tree. There are tons of tutorials and ideas out there ranging from super easy to expert, so you’re bound to find something that works for you. Fill a balloon with confetti (to add a little more fun) and some rolled up bills. Remember that these bills can easily weigh down a balloon once they are inflated, so be mindful of how many you place inside. For best results, hold off on inflation, if possible, until a couple of hours before you present the gift. Use scotch tape to attach several bills together in a row and roll them into a circle. Then, take an empty tissue box and place the money inside, pulling it up slightly so it pops out the top. 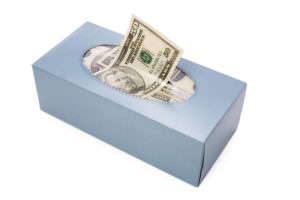 You could also attach a tissue to the first bill so it looks like a normal box of tissues at first glance. Print out a cute tag to place on the outside of the box or decorate it to make it special. Buy a clear ornament that has a removable top. Then, roll up the money and place inside the ornament. To help add a little extra holiday cheer, throw in some green & red colored confetti or crinkle paper. Finish off with a bow tied to the top cap for that extra touch.